So proud of the team at Shendals, we have been awarded the Womo 5 star... read more..
Youngblood CC perfecting primers are so beautiful. This... read more.. The Shendals newsletter is a great way to learn about new products and styles from our salon aswell as special offers! At Shendals we understand that going to a new hairdresser or beautician can be stressful! We want to put you at ease. All of our stylists, makeup artists and beauty therapists are fully trained and fully qualified. At Shendals we only have a team of expert stylists and therapists that are dedicated to enhancing your day. We truly believe you will be delighted, we guarantee it. In the unlikely event you are not totally delighted with your hair or beauty service we will re do it for FREE! BOOK ONLINE 24 HOUR LIVE NOW! 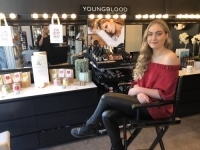 So don’t risk your hair or your beauty services to any salon, come and experience Perth's best customer service salon, a salon with hairstylists, makeup artists and beautitions that LISTEN and CARE about YOU. How you look and feel is very important to the Shendals Team, come and experience this only at Shendals. "What You MUST Know Before You Book Any hair & beauty salon in Perth!" How can you be sure you’ll get the BEST service in Perth when booking your Hair & Beauty salon on the Net? Here's 7 GREAT reasons… Why Shendals one salon should be Your 1st Choice For An Amazing salon Experience…. We fully Guarantee that you will be totally delighted or we will re do your hair for FREE! You’re ALWAYS allocated an extra 15 minutes for every treatment …So you’ll NEVER FEEL RUSHED! FREE PARKING at our convenient Applecross location (less 8kms from the CBD), which means you can relax and enjoy your treatment without the worry of an expired parking ticket! Impress your partner, special friend or family with our EXCLUSIVE GIFT CERTIFICATES, perfect for ANY SPECIAL OCCASION and have peace of mind to know that they NEVER EXPIRE!. which means your loved one can use them whenever they want. OPEN MORE HOURS: Tues, Wed , Fri from 9am till 5.30pm and every Thursday 9am till 8.30pm & Saturday 8 am till 4pm … you’ll get in when YOU want! And, with extra staff on EVERY shift, we can take your last minute bookings! All of our Team of stylist are fully trained to Shendals standards to Guarantee quality. Shendals can do your complete look . Hair, make up, beauty & weight loss at Shendals. Our professional beauty specialist will complete the total look with make up styling imagine the time you will save! 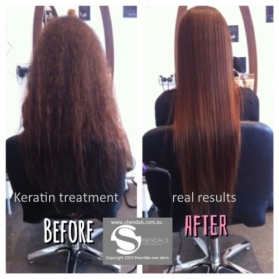 Shendals have a amazing new Keratin smoothing treatment. The keratin treatment is formaldehyde, glutarald & parabens FREE. It will add shine & smoothes your frizzy hair! Shendals Keratin treatment is particularly recommended for frizzy hair, both natural and colored or bleached and it is indicated for smooth, anti-frizz and restructuring effect. It can last up to five months. Best Keratin in Perth Keratin Smoothing Therpy at Shendals Keratin complex applecross hair salon, Applecross best salon. Kerasilk smooth shiney treatments.